The Battle Stone is a late Pictish symbol stone of green slate, probably dating to the mid 11th century. It is a Class II stone, which means it bears Christian symbols on one side and more traditional Pictish symbols on the other. In this case, the stone has an incised Celtic style cross, a pair of fish monsters, and a beast on one side, and a serpent, ox skull, bird, dog, and horseman on the other. The stone stands about 1.75 metres high (just over 5.5 feet) and can be found beside the path in the lowest part of the graveyard outside historic Mortlach Kirk. The stone is traditionally said to commemorate the victory of Malcolm II over the Danes in 1010. 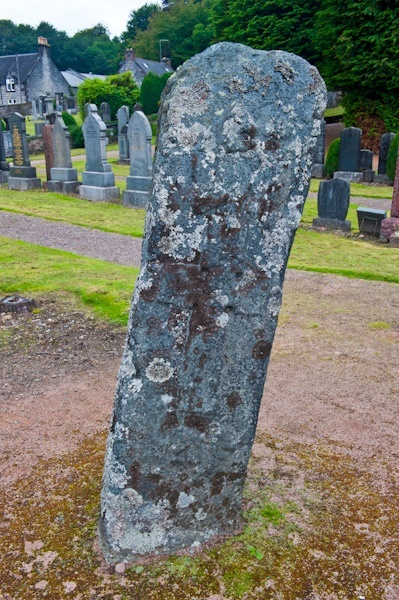 The Battle Stone is only one of two Pictish stones at Mortlach. The other, probably older, is in the church vestibule. This second stone has an incised carving of a beast, possibly an elephant, and a curved symbol which may represent a brooch. There is another symbol stone at Inveravon, 8 miles away. Having described the carvings, in truth the stone is very hard to decipher; it is very worn and covered with lichen. The cross is easy to make out, but the rest of the carvings can be difficult to see. It took me a good ten minutes to find the stone; it is in the lower section of the graveyard, surrounded by fairly modern gravestones. 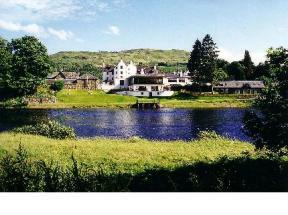 This semi-detached cottage is in the town of Dufftown in north east Scotland and can sleep two people in one bedroom. This pleasantly presented mid-terrace cottage is located in Dufftown of Moray in Scotland and can sleep three people in two bedrooms.